A small sign that is disproportionate to the large brick building it hangs from is the only exterior indication of Emmanuel Thai and culinary life at 35 Maiden Lane. 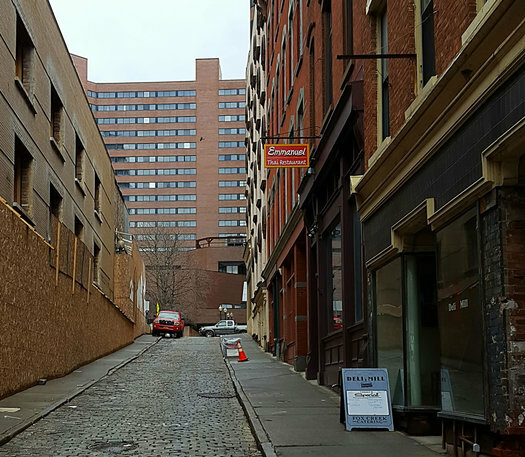 There is no sandwich board on Broadway or North Pearl Street that herald eaters along the block for lunch or dinner. The sloped sidewalks of the narrow street are ill-suited to cafe tables. The azure interior is shocking against the bland facade: The vibrant hue foreshadows the punchy flavors that follow. 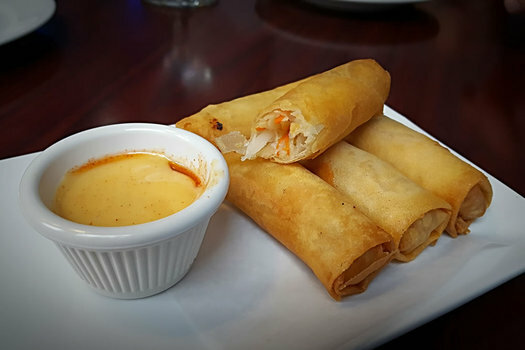 Vegetable spring rolls ($5.95) are fried to golden perfection but remain slightly chilled on the inside. The rice paper wrapper shatters with even a gentle bite, making for a stark contrast to the cabbage, carrot, and mushroom filling. A plum sauce is served on the side and requires a gentle whisk with your fork to bring emulsification back. 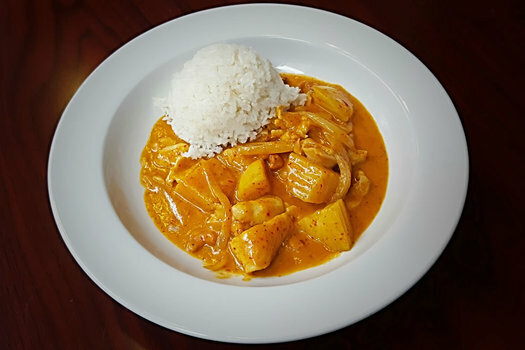 The lunch version of Massaman curry with chicken ($7.95) is a generous portion of coconut milk and curry paste simmered together, blanketing boiled potatoes, pounded chicken breast strips, and long slivers of yellow onion. Ask for it spicy, and pepper paste is smeared throughout. Meaty but tender cashew halves are scattered about and the curry is served with a rounded portion of rice. A variety of protein (seafood, tofu, beef, pork) is also available, some options with a slight upcharge. Pad Thai is a solid version of the classic dish -- long thin noodles are swirled together with bean sprouts before being flash-fried in a pan with egg. Shocks of verdant green appear courtesy of chopped scallions. 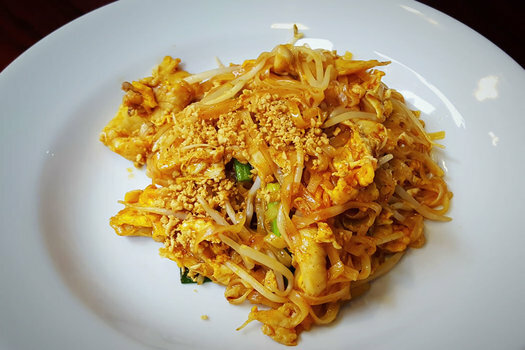 The lunch portion of pad Thai is also $7.95, the case for most entree options at lunch. Sushi is also available at Emmanuel Thai, but save that for a Japanese-focused restaurant, especially since the Thai food here is so appealing. Online ordering if available if you are in a time crunch, but don't hesitate to tuck in at this hidden oasis at dinner before perusing Albany Center Gallery (kitty-corner from the restaurant) or taking an evening stroll along the Hudson. Downtown Albany is alive and growing, and places like Emmanuel Thai that accommodate the commuter lunch crowd and the resident evening population herald in the next wave of Albany life. They have weekend hours, which is refreshing, though I wouldn't be surprised if those hours shrink a bit in the future. Stopped in Saturday and had the Kao Soi and it was absolutely delicious. Great addition to downtown especially for residents, hope they're able to stick around. Note to author: I have seen a sandwich board sign out on Pearl for Emmanuel. Must get down there soon and give it a try!